It is helpful to remember that the arguments concerning creation versus naturalistic evolution are not a new scientific issue. The apostle Peter understood that the philosophy that rejected the message of Scripture was not scientifically based, but rather it was an open and conscious rejection of the evidence available in the “things that are made”—demonstrating that the very character of the Godhead and His eternal power are “clearly seen” (Romans 1:20). In our own lifetimes, evolutionary scientists continue to generate sophisticated arguments to ignore the “clearly seen” evidence. Their own top-tier colleagues have begun to promote the (new) Darwinian idea—the notion that life originated from a primordial conglomeration of chemicals that over vast ages and through randomly generated combinations resulted in a “common ancestor” from which all life developed. Rejection of this fanciful tale is not limited to creationists! Nor has the naturalistic community just recently come to the conclusion that these theories will not work. This book was written nearly 30 years ago! Yet, no one has refuted their computations. Many have willingly rejected their insistence, but the proof still stands. Acts & Facts readers will probably recognize Dr. Lewontin’s quote. Our speakers frequently cite it because it reveals a “willing ignorance” on the part of those who formulate the “evidence” foisted upon the naive public and struggling student bodies of the world. One of the most common misunderstandings among Christians is that the biblical account of creation can be allegorized or harmonized with the evolutionary system of science. This is not possible. 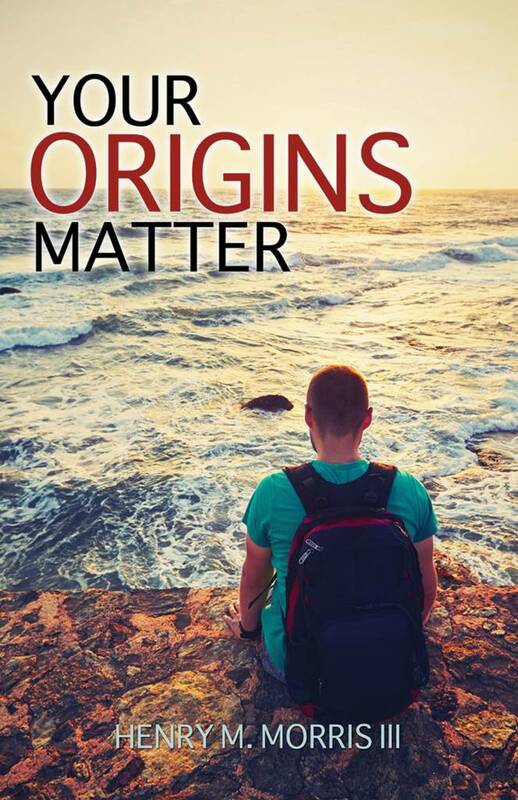 Both the evolutionary explanation for creation and the biblical account are faith cosmologies—that is, they are “stories” of how things came to be. But neither can be put to scientific testing. Science requires that you can test, reproduce, and falsify or prove the “story” that is being evaluated. 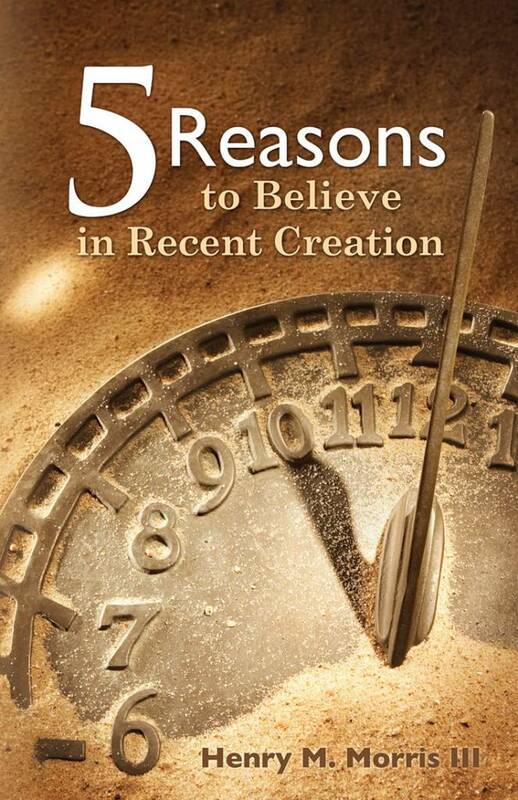 Since neither evolution nor creation can be subjected to those criteria, each individual is left with the absolute choice of believing one or the other. In fact, it is only the Christian apologists who attempt to homogenize the two messages. The evolutionary naturalist never does and scoffs at the Christian who attempts to gain his favor by denying the words of the Creator—words only the Christian professes to believe. 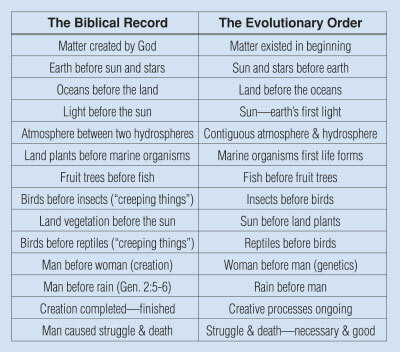 These opposing belief systems can easily be compared by a simple chart listing the foundational points upon which they rest. 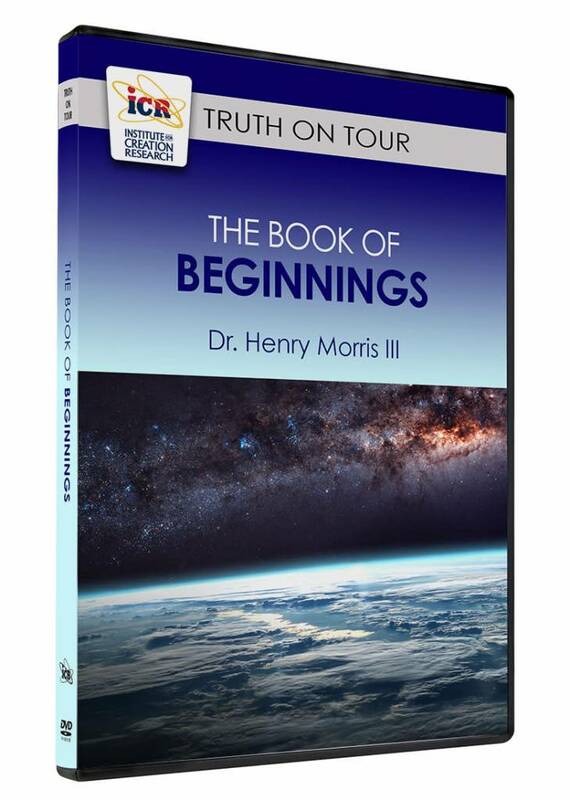 While the evidence for the scientific confirmation of the biblical model is vast and significant research is ongoing, the resistance to this evidence is increasing. Critiques of the evolutionary models are even increasing from among their own colleagues! However, all of those who embrace those naturalistic presuppositions are united in resisting any acceptance of a theistic or supernatural intrusion into the discussions. The one exception to that resistance, interestingly, is the growing acceptance of Panspermia. This theory insists that life exists in some form throughout the universe and has found its way onto our planet by assorted space detritus (meteorites, ice crystals, etc.) or through the design of some form of super-intelligence that exists in another galaxy. Usually, the argument is based on the known lack of evidence for an evolutionary origin of life which then requires a non-evidentiary solution—that is, a presupposition (without evidence) that explains the predisposition to “believe” in naturalistic evolution of all things. Only a fool looks at the overwhelming and worldwide evidence and then says, “There is no God” (Psalm 14:1). “Willingly ignorant,” indeed! It is not surprising that God insists that those who reject the evidence that He has imbedded in the very creation itself are “without excuse” (Romans 1:20). Holye, F. and C. Wickramasinghe. 1984. Evolution from Space. New York: Simon & Schuster, 148. Lewontin, R. Billions and Billions of Demons. The New York Review of Books. Posted on nybooks.com January 9, 1997. Cite this article: Morris III, H. 2013. Willingly Ignorant. Acts & Facts. 42 (3): 5-7.